Have you ever thought to yourself, “Do I reeeeally want to go to the dentist today?” Maybe you even considered not worrying with the dentist at all. Well after reading about one of our Garner NC patients you will definitely reconsider. 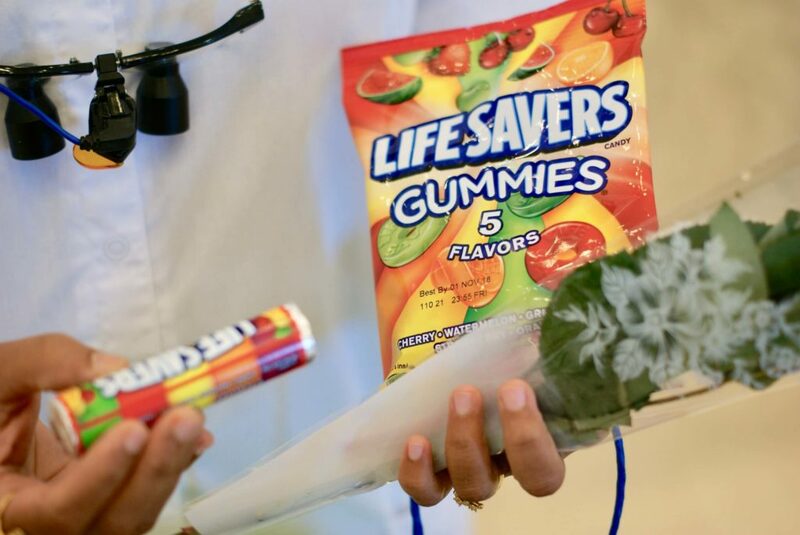 We want to spotlight one of our patients named Rick Heilmann who came into the dental office for his routine dental exam in January 2018 and found something unexpected. Find out why a routine dental exam could save your life! Read the article published on page 8 of Johnston Now Magazine here or continue to read below. 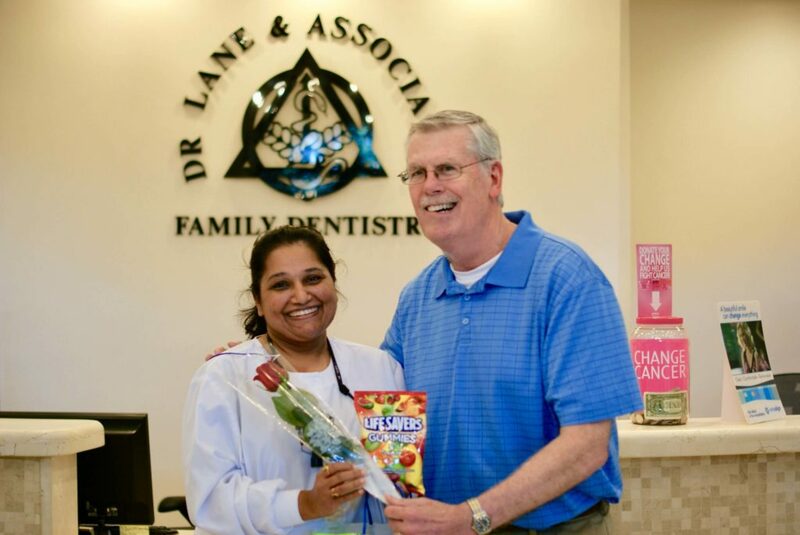 Rick Heilmann brought his dentist, Dr. Chitra Hardikar, candy and flowers after she discovered tongue cancer during a dental exam in January 2018. One of the first things he wanted to do after his cancer surgery was to thank her. CLAYTON — Rick Heilmann thought his January dental visit was going to be routine, much like the many other dentist appointments he had through the decades. Heilmann, General Manager and owner of WKJO Country Superstars 102.3 in Clayton, knew from raising three children that regular dental checkups were important. What he didn’t realize is that they could also be lifesaving. While this would be shocking news to most patients, he was relatively calm. A few months earlier, his dermatologist discovered skin cancer below his earlobe. When it was removed, he was told that cancer would not spread to other parts of his body. So, he wasn’t expecting the finding by his dentist. The follow-up appointment was for a biopsy by NCOSO oral surgeon Dr. Ryan Milewski in the Raleigh office of Lane & Associates. The results came back as squamous cell carcinoma of the tongue, a relatively common form of skin cancer with three percent of all malignancies arising within the oral cavity. About one million cases of squamous cell carcinoma are diagnosed each year in the U.S. There are more than 15,000 deaths annually from the disease. After being referred to an ear, nose and throat doctor at the University of North Carolina at Chapel Hill, he underwent surgery to remove cancer in his tongue and to further explore his neck area, where additional Stage 3 cancer cells were discovered. Heilmann, 64, did not need to undergo chemotherapy but had radiation treatments for seven weeks which were completed in July. He worked throughout his treatments and maintained a positive, upbeat attitude through it all. He’s been married to his wife Teri for almost 40 years. They have three children, Carlie, Jessica and Joey, and six grandchildren — all who live within 50 miles. Dr. Don G. Lane, who founded Lane & Associates Family Dentistry almost 40 years ago in Fuquay-Varina, said dentists are doctors for the head and neck & don’t just look at a patient’s teeth. “We perform oral cancer screenings for every patient during their comprehensive exams,” he said. “We look at your joint, your bite, your oral health environment, possible pathology of your oral cavity and neck, and even how well you sleep. Ultimately, all these things play a vital role in your total overall health. You don’t have to convince Heilmann of that. “My experience changed the importance I place on regular check-ups,” he said. At Lane & Associates, we are proud to offer Oral Cancer screenings for every patient at our routine dental cleanings throughout all 29 offices in central North Carolina. If you have any questions or concerns regarding Oral Cancer Screenings or any issues you may be experiencing please reach out to our dentists & give our offices a call!